Born in Charlottesville, Virginia, the son of a veterinarian and a nurse, George Hambrick attended Concord College and University of Virginia School of Medicine. Following an internship at University of Iowa Hospitals, he trained in dermatology at Columbia Presbyterian Medical Center and Duke University Hospital. From 1948 to 1950, he served in the U.S. Army in Georgia, Okinawa and Japan. Over the course of the next 60 years, Dr. Hambrick held appointments at Columbia University, University of Pennsylvania, Johns Hopkins University, the University of Cincinnati, and Cornell University. In 1969 he became the first full-time professor of dermatology at Johns Hopkins leading a sub-department to full departmental status. 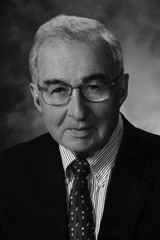 Likewise at Cornell, he along with Martin Carter fostered the division of dermatology to full departmental status, where the George W. Hambrick, Jr. Professor of Dermatology was created. Dr. Hambrick is a Professor Emeritus of Dermatology at Cornell and Senior Lecturer at Columbia. His practice has centered on the personal delivery of skin healthcare to several thousand patients. His scientific contributions include pioneering clinical and laboratory investigations of chloracne due to chlorinated naphthalenes in electrical workers and of heritable syndromes - Hurler, Scheie and ocular albinism. He played a major role in the development and programming of the Dermatology Foundation and the Society for Investigative Dermatology as secretary and president of each. He was a delegate to the House of the American Medical Association for 11 years. Among his honors are the Dermatology Foundation's first Lifetime Career Educator Award for his dedicated service as a mentor and role model for trainees and students, his ability to impart knowledge with enthusiasm and his capacity to inspire pursuit of greater dermatological understanding. In 2007, he became a Johns Hopkins distinguished medical alumnus, the highest honor given for those whose achievements exemplified the heritage of excellence. He belongs to the Raven, Jefferson and Jamestowne societies and Alpha Omega Alpha. He holds honorary membership in the American Academy of Dermatology, the Society for Investigative Dermatology, and the American Dermatological Association. With more than 75 publications to his credit, he served as an editorial advisor to Skin & Allergy News and as a member of the editorial board for the Journal of American Academy of Dermatology. In 1987, together with Rockefeller University's D. Martin Carter MD, PhD and Peter Bentley, Dr. Hambrick founded the American Skin Association to represent the interests of skin disease victims and their families. Today, led by Chairman Howard Milstein and a dedicated 24-member board of directors, the American Skin Association remains a singular voice committed to overcoming the most serious forms of skin cancer and disease through research and education.